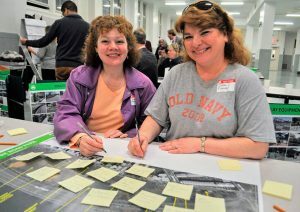 Bay Ridgites brainstormed features and programs they’d like to see in the multi-million-dollar reboot of Shore Road Park at a meeting on April 27. Local conservationists and Parks Department workers poured over maps of the park at Fort Hamilton High School and put their heads together to develop a wish list. This is the first step in a long journey to revitalize the sprawling parkland, said the Parks Department’s borough commissioner. For those who couldn’t make it to the meeting, or who have a fresh thought they’d like to share with parks designers, Nelson, Pope, and Voorhies is accepting e-mailed suggestions for the next two weeks at rschmidt@nelsonpopevoorhies.com.